This tiny pizza joint, in the northern part of the Marais, is packed with good cheer and new friends. They use organic ingredients and have pizza combinations I’ve never heard of. I had the eggplant pizza that also included goat cheese and hummus. This would be great without the cheese for vegans. 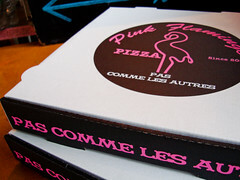 The original Pinks is located along the Canal Saint-Martin. This walk up window makes deliveries to the canal. I actually ate there a long time ago and had the fig pizza. This is a perfect picnic lunch for a stroll up the canal. You’ll find it by looking for pink balloons. That is how they find you for a delivery. If you’ve tried Pink Flamingo in the past, it’s worth stopping by for another bite. They are continually trying new flavor combinations and the menu is dynamic. Say hello to the person sitting next to you, this is a convivial restaurant. I visited the Marais location, which is tiny. Other locations are also small and take-out friendly. I would hesitate to suggest they have wheelchair-friendly restrooms. Their web site uses flash, so the menus are not accessible to screen readers. Previous Post Pain, Vin, Fromages – the name says it all.